Explorer: Seeks the material ("facts, concepts, experiences, knowledge, feelings," etc.) needed to build a new idea. "During the course of your searching, you'll poke around in unknown areas, pay attention to unusual patterns, use different senses, and seek out a variety of different information." Artist: Takes what the Explorer found and gives it a new twist to come up with a new idea. "You experiment with a variety of approaches. You follow your intuition. You rearrange things, look at things backwards, and turn them upside down. You ask 'what if' questions and look for hidden analogies." In other words, innovation doesn't come out of thin air. There's some artistic work to be done. Judge: Helps evaluate the new idea, "critically weighing the evidence, looking for drawbacks, wondering if the timing is right. Unfortunately, this is the stage that many people start at (did school teach us creativity skills and mindset ... no, probably not), which explains why there is so little innovation in the world. Warrior: Brings your innovative new idea to fruition (without implementation, it's just an idea floating around in your head, waiting to be stolen by someone else with more guts or wherewithal). You "develop your strategy, and commit yourself to reaching your objective.... You may have to overcome excuses, idea killers, temporary setbacks, and other obstacles. But you have the courage to do what's necessary to make your idea a reality." 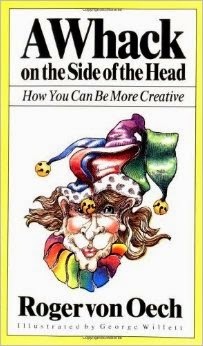 von Oech's book focuses on the first two roles, guiding the reader through numerous fun and evocative creativity exercises. He explains the importance of ambiguity, for example, in helping us to "think something different." He quotes American General George S. Patton, who said, "If you tell people where to go, but not how to get there, you'll be amazed at the results." von Oech explains that posing a problem in an ambiguous way [gives] more people's imaginations more freedom. When we think about all this in relation to the climate change crisis, we can see that our lack of progress truly is a crisis of imagination and creativity. Children have great imaginations, but it's like a muscle that atrophies if not exercised. Once we can picture that zero-carbon world, it's easy to discuss and picture how to get there: a zero-carbon economy that subsidizes renewable energy and taxes carbon and other forms of pollution; moving towards self-sufficiency in our food and energy production; giving up meat as a gift to our grandchildren; staying closer to home and taking 100-mile vacations; doing all this out of compassion for the people already horribly impacted by climate disruption in Africa, the Arctic, the small island nations, and, increasingly, all those depending on water sources that are drying up, even if just seasonally. General Patton suggested that we have to clearly tell people what the destination is -- in this case, a carbon-free world. (We're not even doing a very good job of being clear about that!) Now, let's use our creativity and our imaginations to innovate our way out of the Burning Age as rapidly as possible.